Hey friends! I know it's been a while since I last checked in with you all. The last few months have been crazy with finishing up my front end developer bootcamp and wedding planning! Even though we have been planning these weddings since last year, most of the little details which I didn't think about before have snuck up on us, and it's been a whirlwind to get them done. With the excitement of the weddings I am also reminded that my favorite season, Fall, is quickly approaching! One of the things I love most about Fall, besides the leaves changing and cool weather, is Fall fashion. I love cuddling up in cozy scarves, sweaters, leggings and boots. Gabe and I have decided to extend the cool weather, Fall theme of our wedding to our honeymoon to Montreal, Canada! With the approach of Fall and our honeymoon, I have been stalking all my favorite stores for new items for my closet. The sweater that I am wearing in this post is by one of my absolute favorite brands, Madewell, and can be found at Nordstrom. I love how soft the material is and I didn't even realize that it has an open back until i tried it on, which was a nice surprise! One store that I am loving many of their Fall items is Shein. In the past I've purchased a few dresses from them which I love because their products are not only super affordable but really well made! My dresses have lasted over 5 years! 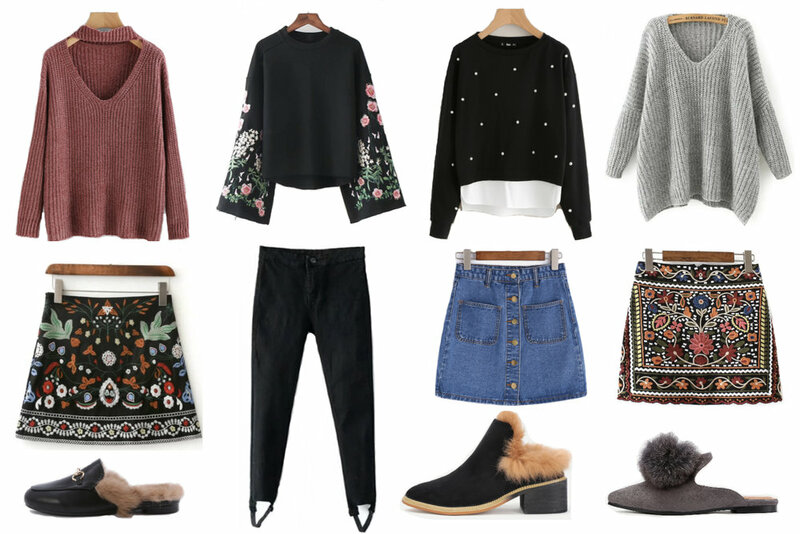 I am really digging the embroidered trend for Fall as well as pom-pom and fur on boots and mules. One trend that I am excited to try as a throwback to my childhood are stirrup leggings/jeans. They definitely create a more seamless look when tucked into boots. Check out my top picks for Fall from Shein below! What trends are you planning to try this Fall/Autumn? Is there something you're planning to try that is out of your Style comfort zone? Please share with me in the comments below! I hope you enjoyed the post! You can also find me on Facebook, Instagram or email.